Jacket and skirt in black wool crepe without lining; white wool jersey sweater. 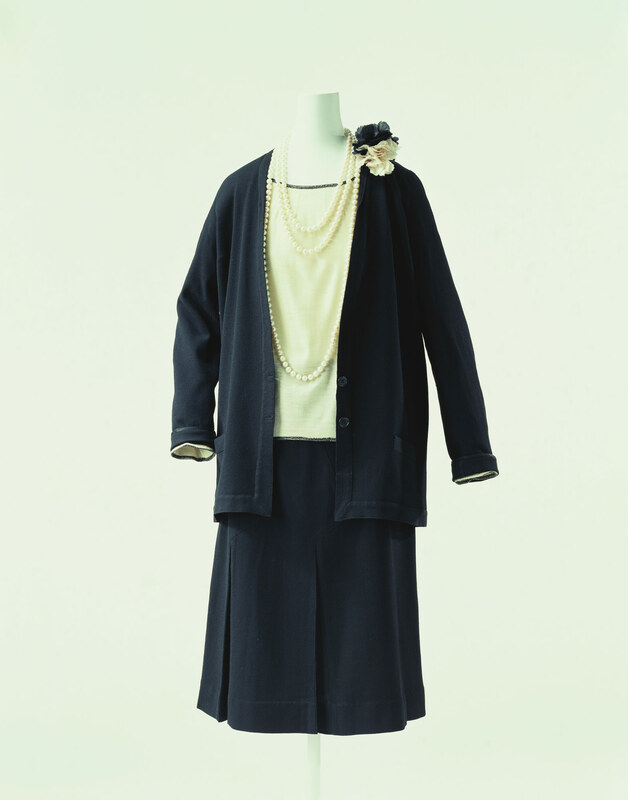 This 1920s ensemble with a cardigan and a knee-length skirt is one of Chanel's best-known works. Its simple forms and monochrome color are the result of the puritanical elimination of decorations in sharp contrast to the preceding period. A corsage brightened this ensemble was a white and black carnation, not yet camellia. In 1916 she introduced cardigan suits, made of jersey that had hitherto mainly been used for underwear. Jersey, elastic easy-to-wear material that does not hinder body movements, short skirts, and simplified beautility gained favor with women active in society. Today, in the 21st century, these innovations are still basic to women's clothing.